Good morning Polished Peeps! How are you all today? I do hope you're well! We are enjoying a minor heat wave, if you can consider 45 degrees with extreme dampness thanks to the melting snow a heat wave. It isn't going to be long lived though because next week they are forecasting another plunge in the temperatures. Today on the blog (and for the next few posts) I have a little something different to bring you. It's still nail art, just of a different kind! A few weeks ago, I was contacted by Incoco to review their real nail appliques! As a person who has never used nail stickers/appliques before and probably never would purchase them ever, I was rather hesitant to say yes. I always figured they would be difficult to apply, hard to use, and a waste of money, so I always stuck to purchasing polish. I am happy I said yes and can now share with you these posts! 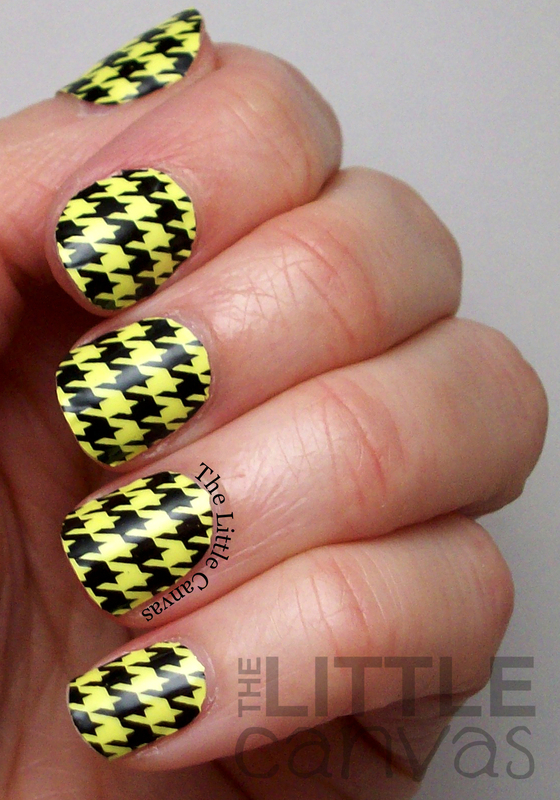 The first applique I have for you is On the Edge, which is a neon yellow and black hounds tooth design. Let's take a look! The yellow is much brighter in person, it kind of freaked my camera out as most neons do. Awesome design, right? 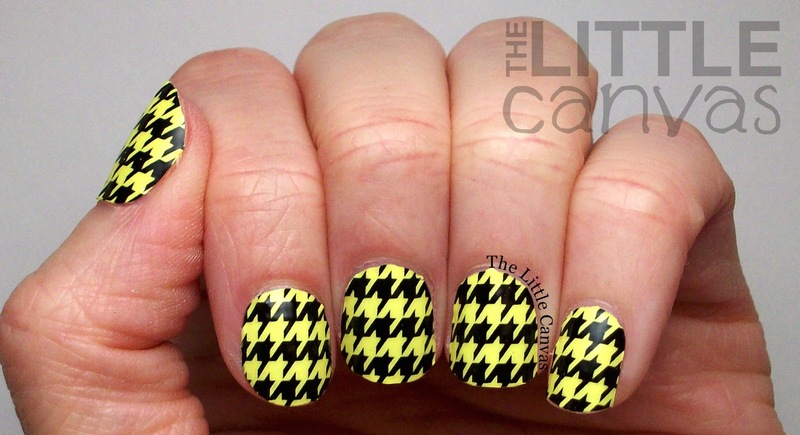 I really love the yellow and black combo! The Incoco Real Nail Polish Applique package comes with a set of 16 different sizes for your nails. 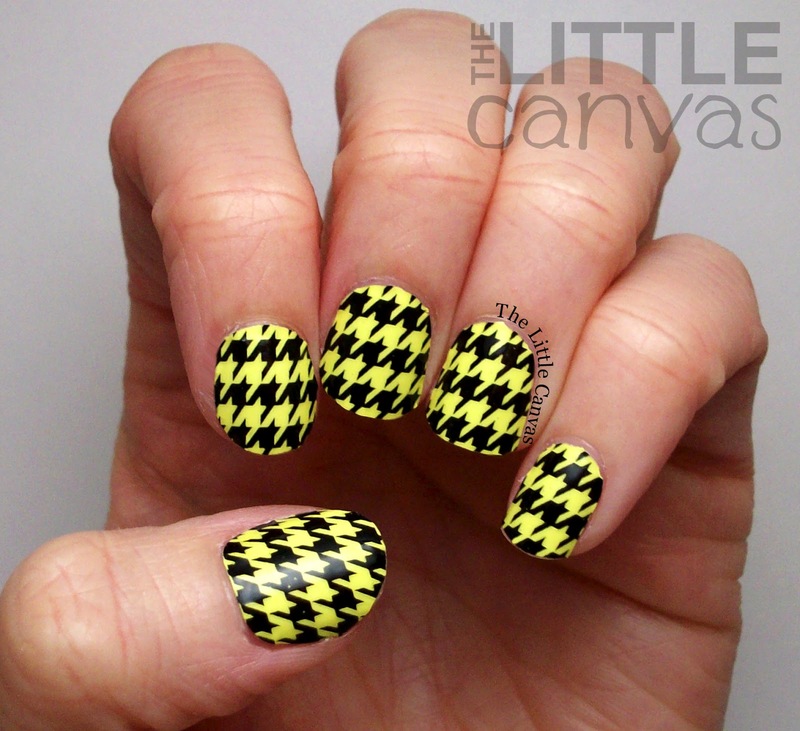 Each strip is "double" sided so if one side doesn't fit your nail right, then the other side most likely will. I have always thought that I have a wonky nail shape so I was honestly scared these wouldn't fit my nails at all. When I opened the package, I definitely could smell a real nail polish smell, I felt like I had just painted a base color on my nails and was waiting for it to dry! Due to the smell, I got kind of paranoid that they were all going to dry up before I could get all 10 nails on, but that wasn't the case since there is a clear plastic covering over each little sticker. This was nice because in the end, I didn't feel rushed. When I feel rushed, I get panicky and mess everything up. I followed the directions that came in the package (and also watched the Incoco YouTube tutorial) and started with my pinkie finger. I determined what side fit was going to fit on my nail, peeled away the strip from the plastic, and applied it on my nail. I messed up a little at first, but I was able to peel it right off without ruining the strip and re-apply how I wanted. Once the strip was placed how I wanted it, I stretched the strip as the directions said. Now, this might have just been me, but I ended up ripping the strip. I think I pulled too hard. I then filed what was left hanging off and admired the nail. As you can see on the pinkie, you can see the bottom of my nail because I ended up filing some of it off. I never file my nails (you'll know the reason why if you have read my nail Nail Care Routine post) so I'm not 100% confident with the technique. By the time I got to my pointer finger though, I was getting the hang of it. Ignore the fact that I'm holding my bottle of top coat in this photo. You do NOT need top coat as it is already "built in" to the strip. I'm just so used to holding a bottle of top coat to model my designs so I just went with what I knew. I really, really, really, REALLY love the hounds tooth design. 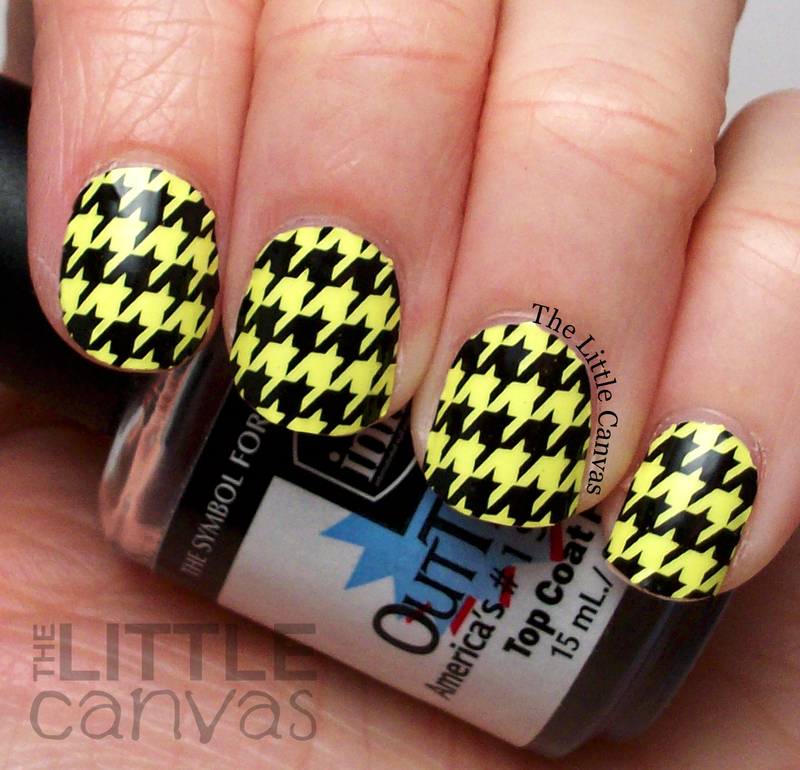 I have never attempted this design and probably won't because I don't think I could get it to look so perfect. After I got the hang of what I was doing, I really found them easy to apply, which in the end is a lot quicker than me trying to ever freehand a design like this. What do you think? Have you used Incoco Real Nail Polish Appliques? If you want to try Incoco's products yourself, you can head on over to their website and browse their huge collection! On the Edge retails for $8.99 but good news! Incoco is offering a 15% off discount to you guys if you use the code CANVAS15 now through March 14th! The Little Canvas is 2! Thanks to You! A Zoya Superbowl Manicure - Go Broncos!